Branded food service outlets at UTM are raising prices in anticipation of the upcoming minimum wage increase. Costs are expected to increase by five to 11 per cent, as opposed to the previous average year-on-year increase of three per cent. Prices for non-branded food are also set to increase, although it is unclear by how much. UTM is set to work with its catering partner Chartwells to keep its non-branded price increases “as low as possible given the increase in labour costs and expected increase in food costs,” according to the minutes of the Food Service Advisory Committee meeting on November 15. The Food Service Advisory Committee evaluates and reviews various policy and operational aspects pertaining to food services at UTM and serves in a consultative capacity responsible to Vicky Jezierski, Director of Hospitality and Retail Services at UTM. The food price increases will also affect student meal plan rates, since these can be used at both branded and non-branded vendors on and off-campus. Jezierski noted that food prices are “the driving force” behind proposed meal plan rates. All branded services are implementing price increases, such as Bento Sushi, Subway, and all branded vendors in the Temporary Food Court, including Booster Juice, Elements, and Pizza Pizza. As of the 2017 University of Toronto Mississauga Students’ Union (UTMSU) AGM, the Blind Duck pub, a UTMSU division, had not indicated increases in price. The pub is currently running a deficit as UTMSU executives opted not to increase food costs last year despite increases in the cost of sales. The UTMSU did not respond to The Varsity’s request for comment in time for publication. With the university takeover of food services from Aramark occurring at the St. George campus on August 1, the university and CUPE have indicated that all former Aramark employees have been offered employment with the university. “All Aramark employees were offered a new job with the university at a substantively higher rate of pay with a pension plan and benefits that they did not have before and the ability for them and their children to attend U of T for free,” said Sarah Jordison from CUPE Communications. While employed by Aramark, hourly wages for most food services workers ranged between $12.00 to $12.80. The university offered food services workers wages at $20.29 an hour with benefits such as a tuition waiver for employees and dependents. In May and June, supporters and active members of UNITE HERE Local 75 — the union that previously represented food services workers at UTSG — voiced concerns over whether all workers would be rehired by the university, the status of the seniority of the workers, and the 90-day probationary period. The union organized protests and a week-long hunger strike. Following U of T’s takeover, food services workers are represented by CUPE 3261. Representatives from U of T had one-on-one conversations with all former Aramark employees in order to establish what their duties at work were and the hours they worked. Macdonald noted that most of these changes will occur in the type of work that people are doing. According to MacDonald, cooks can expect to be using different, more fresh, ingredients than they did when employed by Aramark. Macdonald also told The Varsity that there were six or seven employees, out of 250 food services workers, who did not want to work for U of T; the university did not meet with these individuals. “It’s not like it was a brand new venture to do this all ourselves, there’s some experience with respect to, certainly the things that count…cooking, the ability to cook and the ability to plan menus and to procure food,” Macdonald added, also noting that University College and Chestnut Residence already control their own food services. As the university transitions to in-house food services on the St. George campus, significant changes are coming to the available food options for students. The changes come after the university’s contract with Aramark expired on July 31. The contract expiry sparked rallies led by UNITE HERE members, the union which represented food services workers under the Aramark contract. 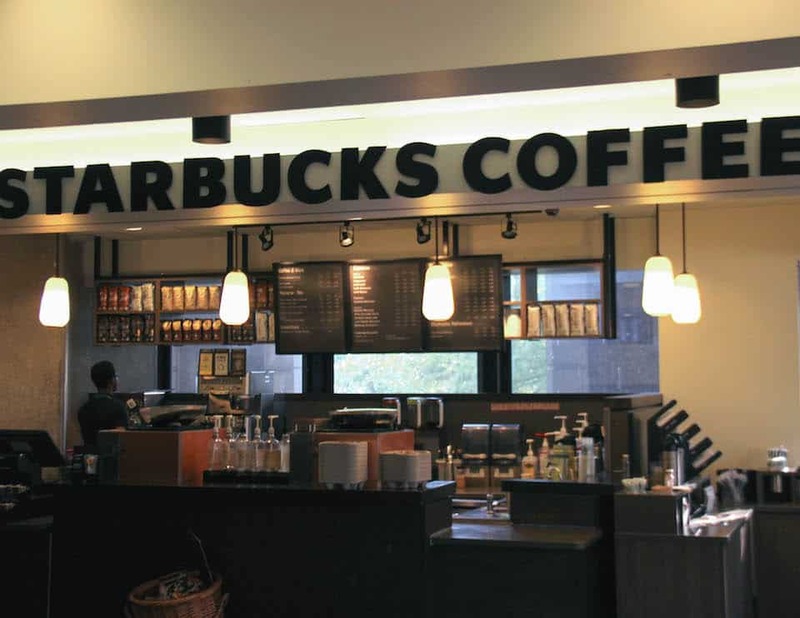 While some franchises, such as most of the Starbucks and Tim Hortons locations, will stay open under the new U of T management, others will be replaced by alternative dining options. The Subway in the Robarts Library food court will be traded for a campus brand serving Mexican dishes called Tortillas and the Athletic Centre Starbucks has also closed. In a conversation with The Varsity, Director of Ancillary Services Anne MacDonald explained that the changes were motivated by the aims of creating healthier and more diverse options for students. Students may already be familiar with the campus-operated Grab’n’Go, which will be expanding its menu to include a greater range of options. This includes a promise to reduce the amount of processed foods, and substitute them with fresh alternatives. A similar plan will be implemented in the New College and Chestnut Residence dining halls, which will introduce more variety to the menu. Students with flex dollars will receive 10 per cent off at these locations in the coming school year. Three new brands will be opening on campus. This month, Pasta Pappardelle, which is a ‘make your own pasta’ joint, will be opening in the Robarts food court. Despite the fact that Pasta Pappardelle is a new brand, MacDonald said that it would build on what was popular about the pasta place that Aramark operated in Robarts. It will be joined by Za’atar, which features a range of different cuisines from the Mediterranean. Za’atar will also open a second location in the Medical Sciences Building. In September, Urban Deli and Stone Oven Pizzeria will also open in the Robarts Food Court. Urban Deli is a new custom sandwich shop, while Stone Oven already has a location in the MSB and serves traditional-style pizza. According to MacDonald, all of the new brands and locations will be run by experienced chefs, and will utilize locally produced ingredients when available. The University of Toronto’s decision to take over food services at UTSG has cooked up some controversy among food services workers. UNITE HERE Local 75, the union that represents food service workers on campus, held a protest and march on the afternoon of May 11, rallying against what they perceive to be employment injustice on the part of U of T.
Close to 150 attendees — including workers, friends, family, and other unions — gathered outside the gates at King’s College Road. They marched up and around King’s College Circle before continuing their protest outside of Simcoe Hall, where the Offices of the President and Governing Council are located. In January, the university announced that it would be taking over food services after its contract with Aramark expires on July 31. UNITE HERE Local 75 argues that this change will affect crucial aspects of its members’ labour contracts, including job security, seniority, and the continuity of a fair wage. Maria Goretti Frias, a cafeteria worker and member of the U of T community for 25 years, described how this transition is different from previous contract handovers that have seen labour rights continue just as they were. Several students were also present at the rally, including members of the University of Toronto Students’ Union executive. The May 11 rally was the second time UNITE HERE Local 75 held a rally in response to the university’s announcement. 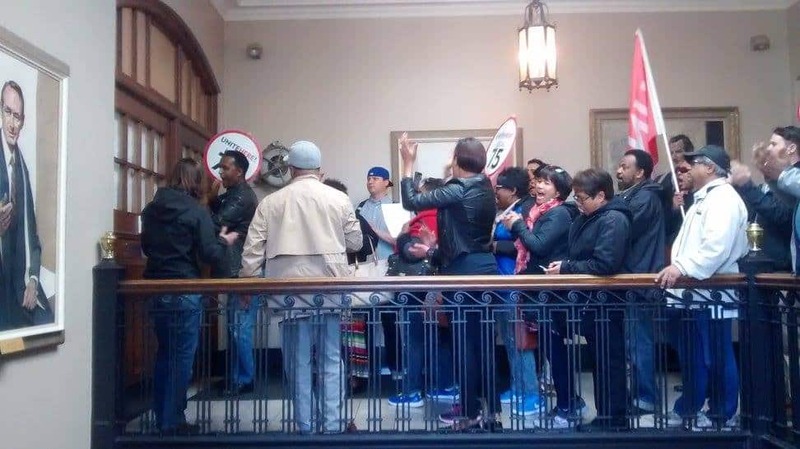 On May 5, members of the union held a smaller rally inside Simoe Hall, just outside U of T president Meric Gertler’s office. Anne Macdonald, director of ancillary services at U of T, told The Varsity in an email statement that 100 job offers have already been made and more are expected in June. Macdonald also stated that the university is taking steps to recognize seniority. One of the challenges food workers are facing is the transition from UNITE HERE Local 75 to CUPE 3261, which represents service workers at U of T. Local 75 represents food service workers in Toronto and is the union under which they would have stayed despite contractual changeovers. The move to employment by U of T, however, will cause them to fall under CUPE 3261 for the purpose of collective bargaining.